I’ve searched for a way to show menu and toolbar entries only in certain perspectives. In case of OpenChrom, the “Chromatogram Edit” entries should be only visible when the user has the ability to modify chromatographic data. 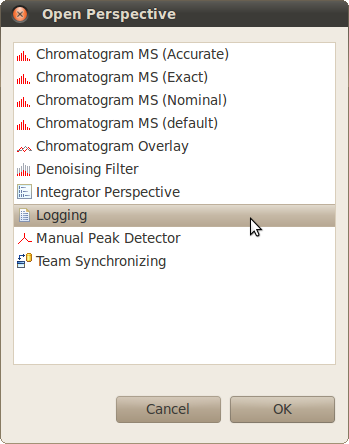 The “Chromatogram Edit” menu entries don’t make sense if the user tries to synchronize repositories or analyze log files. No big thing, we could disable distinct perspectives concerning the editing of chromatgrams, but if another perspective is added by an additional plug-in, the menu/toolbar entries will be visible again. 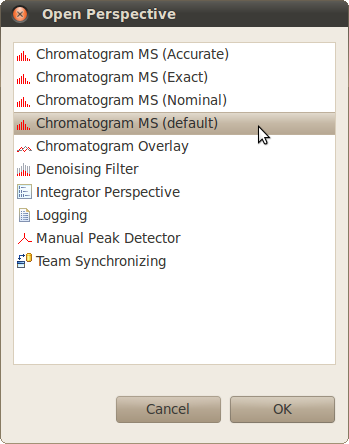 Thus, we should enable the chromatogram editing menu/toolbar entries only when perspectives with focus to edit chromatographic data are activated. To achieve this, we need a unique identifier for the chromatogram editing perspectives. The perspective id is used here for instance. All perspectives that start with the identifier “net.openchrom.chromatogram.” will be used to activate the “Chromatogram Edit” menu and toolbar entries. * Returns true if the actual perspective supports chromatogram editing. But how do we link the property tester with the menu/toolbar entries? First of all, the “PerspecticePropertyTester” class needs to be associated with the “org.eclipse.core.expressions.propertyTesters” extension point. In the next step, the property tester will referenced by the declaration of a test definition using the extension point “org.eclipse.core.expressions.definitions”. That’s very comfortable as we don’t need to reference the property tester directly in the menu and toolbar contributions. Further on, the plug-in will be activated on request. Now, we’ve prepared everything to use the test definition to enable/disable the menu/toolbar entries. It’s easy to disable a whole menu contribution. In contrary to the menu contribution, each toolbar entry must be enabled/disabled separately. It is not easier to use visibleWhen directly with activeWorkbenchWindow.activePerspectiv? thanks for your suggestions. Does the approach also work, if you’ll apply it to a name scheme? For instance, to show the menu if the perspective contains the pattern *chromatogram*? Anyhow, I’ll try it tomorrow. I think the ID needs to match exactly. I’ve tried it. Indeed, it only works if the perspective ID matches exactly. I think it’s a smart solution if only a certain perspective shall be used to show/hide menu and toolbar entries. On the other side, the PropertyTester class approach allows to apply individual testing patterns, for instance using regular expressions or a list of names to be tested. It seems to me that with your code, tool items of an inactive workbench window on a defined perspective would go hidden if the active workbench window’s perspective is not one of the predefined set. So what you see when you turn your head around with multiple monitors might not actually reflect what the user expects to see. I think you could use “or” to check for a list of names. But of course PropertyTester is more flexible. awesome article! It helped me a lot!